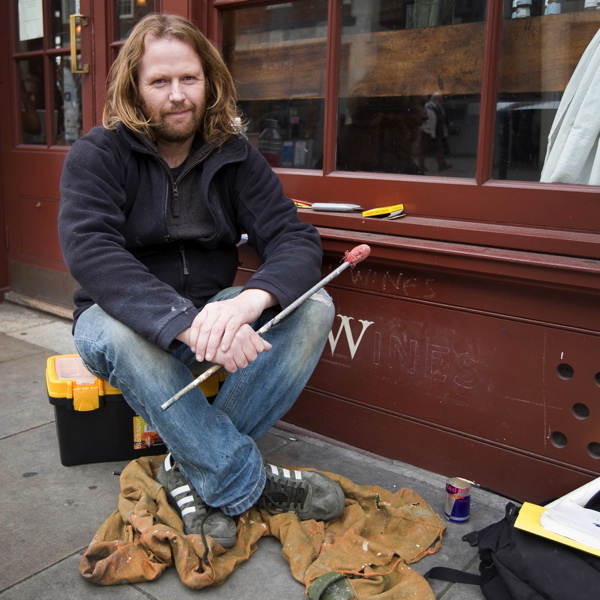 You may have seen Peter Hardwicke in Brushfield St over the last couple of weeks, busy up a ladder or crouched down on the pavement, painting new signwriting on the Market Coffee House which has opened an English Restaurant. “That’s not how you spell ‘restaurant’!” I called out cheekily to him, when I saw Peter standing with his brush poised, while balanced precariously upon two planks supported by tall trestles. Yet such was his professional mode of composure that he simply turned his head and, looking down, gave me a gracious smile of complicity – as if he had never heard that one before. While everyone has gone about their business recently in Spitalfields, Peter has painted his elegantly proportioned letters with placid concentration, apparently oblivious to the chaos surrounding him. 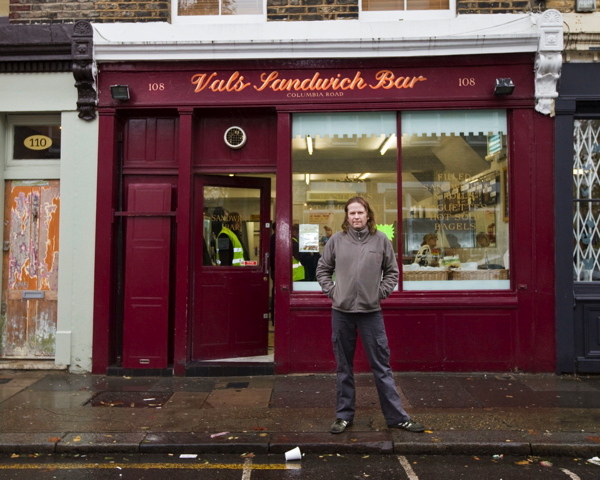 Directly across Crispin St stands The Gun, which is covered in signwriting that Peter did back in the nineteen eighties. Although I admired the flourish of his gold italic script emblazoned there, Peter is a little dubious of this early work because he is aware that tastes in signwriting have moved on. The trend now is for cleaner typography, whereas in the eighties they liked their fascias crowded with letters. 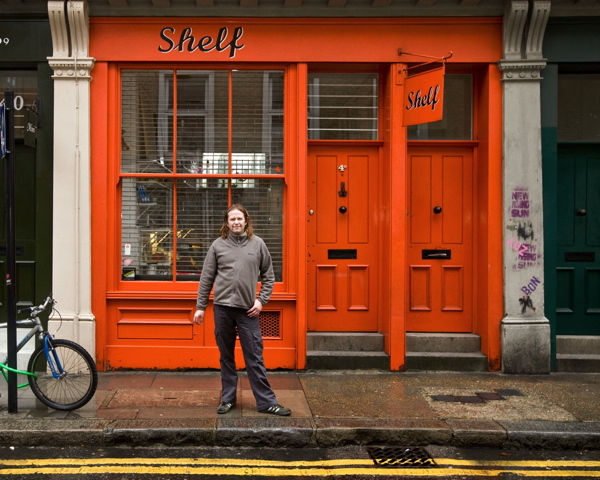 I think we can allow Peter this singular distinction because he knows what he is talking about, since he has devoted all the years between doing these two premises on either side of Crispin St to painting the lettering on shops all over the East End. 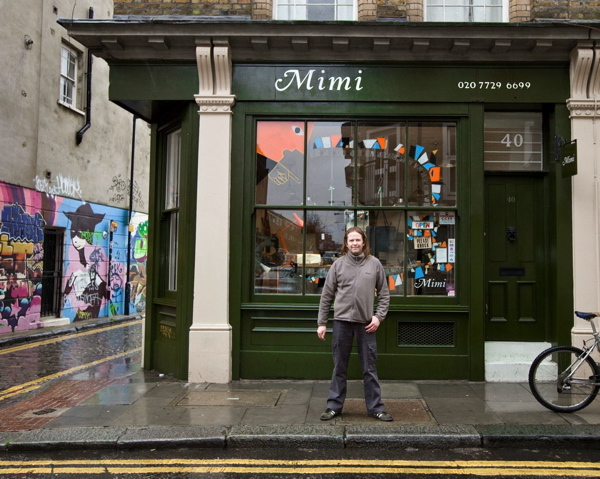 Today, Peter may be the last sign writer in London who works entirely by eye – painting lettering freehand, and positioning and sizing it by eye too, rather using a computer. His innate sense of proportion and knack of placing the words upon the building derive from his practice of working directly onto the shopfront, rather than planning it on a computer and then simply transferring the design, a process that he dismisses as mere “painting by numbers.” And I cannot deny there is a certain heroic bravado to Peter’s work, which provided a popular spectator sport for the curious in Brushfield St last week, as we saw him consulting with the proprietor, then sketching out words in chalk before getting up there in front of everyone, and painting perfect nicely balanced letters, getting it right first time – and spelling ”restaurant” correctly too. I managed to persuade Peter to climb down his ladder and join me for a cup of tea at Dino’s Cafe in Commercial St, where he took the opportunity to explain how he acquired and refined his talent for painting lettering with such grace. “My father was involved in the restoration of historic vehicles, old trucks, and through him I learnt the basics of my craft. But then in 1984, at the age of sixteen, I went on to join a very established traditional signwriting company who did a lot of work on pubs for Courage, Whitebread, Watneys, Combe Reid and Truman’s. I had very good time there and fantastic workmates, apprentices like myself. The owner Ted Ambridge – an absolute genius – taught me everything I know, an complete master he was. I was reasonably competent after three years and I was sent to signwrite my first pub, The Red Lion in Hoxton. I was a spotty faced teenager and the landlord told me to go home.He called Mr Ambridge and said, “I’ve got a young kid here who wants to do the signwriting on the pub.” And he said, “It’s alright, let him get on with it, it’ll be fine.” I done the job and it was very successful, but the point of the story was that although I done the signwriting on this pub, I couldn’t buy a drink there because I wasn’t old enough. It’s one of those trades where the work is very therapeutic and satisfying, it’s almost like a hobby but you are being paid for it. I can be desperately ill and still do it. I think there’d have to be a hurricane for me not to do it. I’ve worked in all winds and weathers. I’ve worked in the snow. Signwriters are a bit like mountain goats. 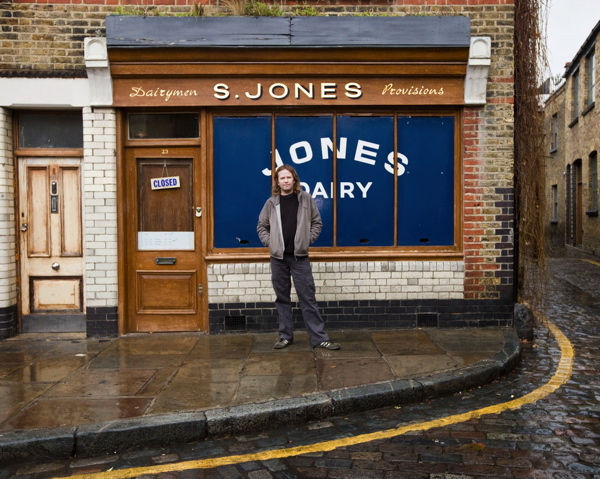 When I started my freelance career, I worked in Central London in the high end of the trade doing gold leaf and glass work, the premium market – the cream of the signwriting trade. But what with the regeneration of East London and being from here, I actually prefer working here. It’s more interesting and I like to see my local area looking good. I get great pleasure walking along Columbia Rd, Cheshire St and through Spitalfields, knowing that I’ve had a hand in creating this environment. It’s almost tribal, here in the East End there is an optimistic flourish to the signwriting even if it is a bit rougher, whereas up in North London the lettering is more uptight, anxious and controlled. I can do any font from memory, though I have own house style, a pointed serif font signwriter’s Roman. We’ve all got it, I can look at any sign and tell you what signwriter done it. It’s just like a signature. You can see the link between the three of us who trained with Mr Ambridge, very classical. I met a guy last week – he stopped in his van outside the Market Coffee House – in his late fifties. He said, “I used to do what you do.” “What happened?” I asked. 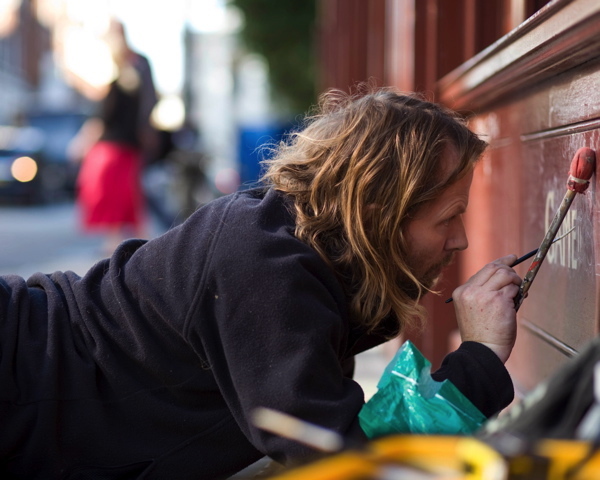 He’d gone over to scanning signs onto plastic with a computer, and the last time he picked up a brush was five years ago. He got quite melancholy,“There’s no work now,” he said. “But there is,” I replied,“If I can do it, you can!”"
Below you can see a proud selection of Peter’s work in the vicinity and you can view his archive here. 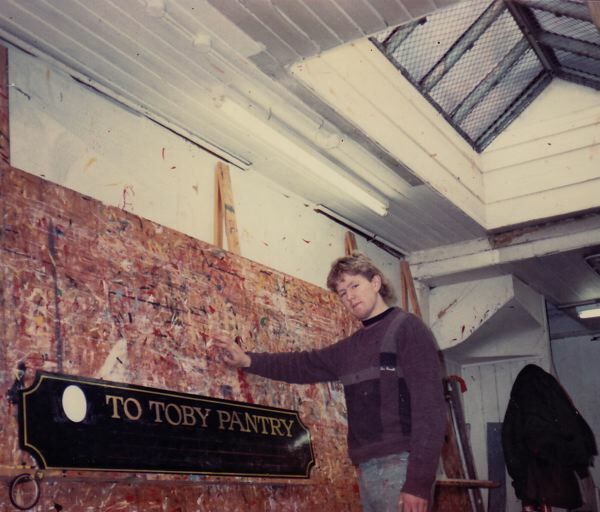 Peter as an apprentice in 1984, aged sixteen, with one of his first pieces of work. Amazing to realise how much of his work I have seen around my part of town. Great write up. Lovely feature, especially now I realise that I’ve been walking under his signs for 10 or more years. Extremely talented guy! Good to know that ‘real’ craft is still alive and functioning in Sign writng! It’s wonderful to find out who’s behind the everyday things that bring so much pleasure to daily life. I loved your piece on Ben Eine too, for similar reasons. PS Any idea who did the sign for ‘Taste of Bitter Love’ on Hackney Road? The coffee is amazing there, however the lettering on the shopfront is computer- generated vinyl. Thanks everyone for your interesting comments. 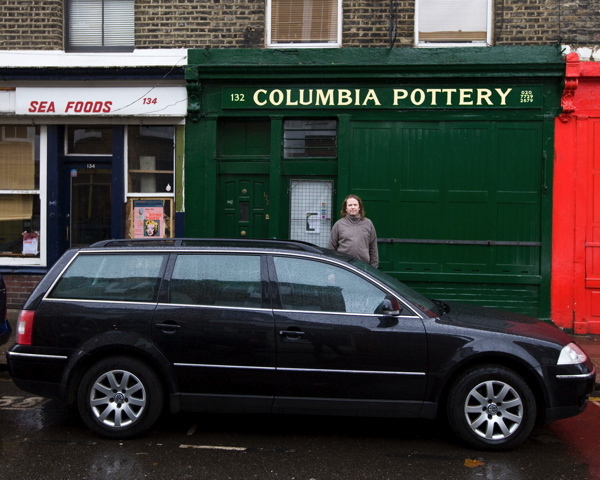 If you see me writing a shopfront, do say hello. Love your work Pete. Only can dream (at this point) of signwriting freehand. My signs are designed on the computer and transferred. 30 years as a designer working with type has got me doing something I really enjoy, but something is lacking … it’s the freehand aspect for sure. Thanks for inspiring me! I really like your work, the distressed effects look amazing! Your layouts and usage of colours are impressive – I feel inspired too! Great work Pete. If you find yourself this side of the pond, come and see me! in gold leaf if I remember rightly. Bloody hell thats my cousin ! I was at Jones dairy just last week and loved the sign work. Great artist at work friends since school days. check out my facebook page – Peter Hardwicke-signwriter. 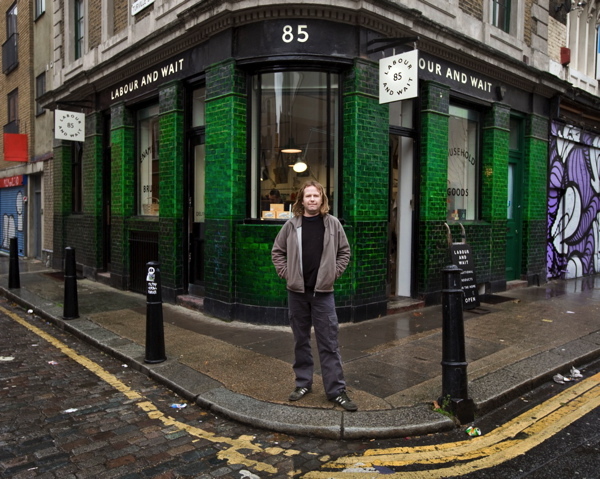 Many thanks to Simon & Rachel at Labour & Wait in Redchurch Street, for giving me a mention on their site. It was a pleasure doing the lettering for the new shop – I must say, it looks great, inside and out. Great article, nice work! 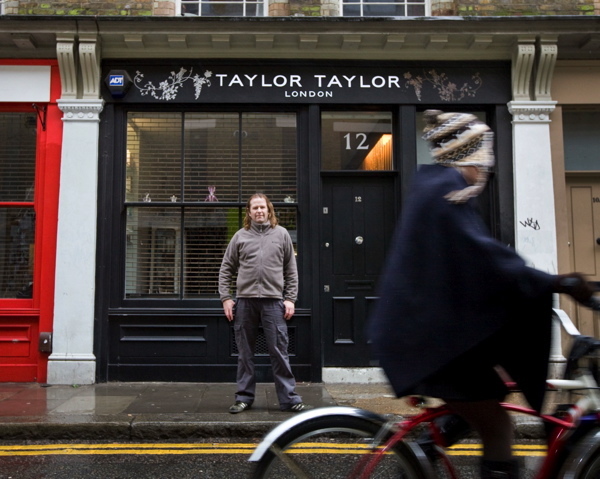 For some more on historic signs painted onto walls check out the Ghostsigns Project. Great read thanks for sharing your work Peter. I started in this trade at 16 also. best job in the world….! You have a very nice style going mate. I love posts like this – a true trade with true talent & skills. Nice to see the hand at work. There are but a few of us left Pete. The brush is mightier!! I have known Pete for many years. He is without doubt, the best in his field. As a person i can say with confidence that his humility for mankind eclipses the the kindness in his craft. I am clearly a fan and hope to hear more about the effervescent creativity he produces in the signwriting world we enjoy without realisation at times. Lovely article, thank you gentle author. My dad was a signwriter and the comment about each having their own ‘signature’ made me smile – I was always able to recognise his work. He completed a five year apprenticeship in the early 1960′s in the Dickensian conditions of a signwriting firm in Aldersgate St (one bitter winter, when working in the basement my dad could hardly feel his hands, the boss kindly said, ‘Don’t be cold – here’s a piece of cardboard to stand on’…). Such a skilled trade and always a pleasure to see a traditional, painted sign.